Welcome our Book Section! Your Place to get FULL color Books on Marx Figures! We also have some limited posters available. This is our fourth Illustration guide to Marx Figures. Module No. 4! 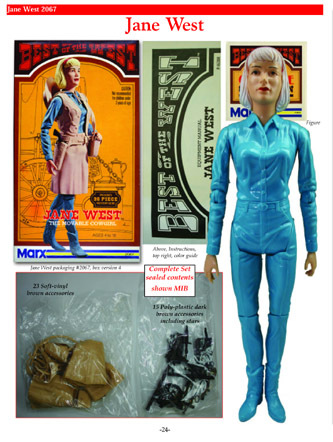 Over 97 pages in full color, covering an in depth look at the early issued U.S. Marx figures! This module far exceeds what the Encyclopedia delivered adding prototypes, test shots, retail catalogs, Sears combos, and so much more! This is by far our best produced book to date! 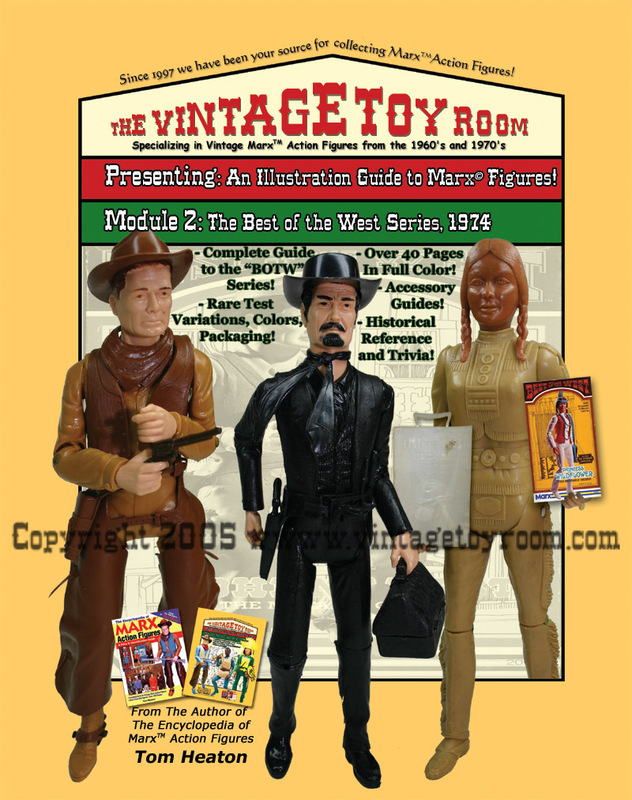 A close look at vintage box art, and story around the great toy company launching the western and Fort Apache 1/6 scale figures. If you like the Encyclopedia, and Module #1, Module #2 and Module #3, you will love this new module! All Copies Numbered and signed up to the first 100! Cover is laminated to insure longevity! Check out the pictures! 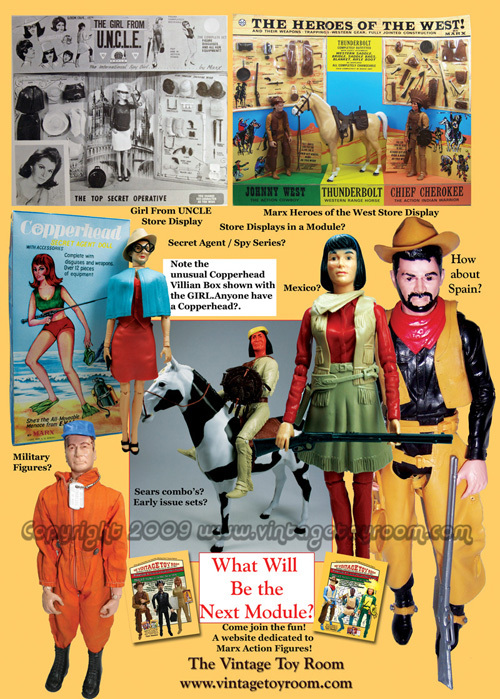 For a limited time, a 1964-1967 Western and FAF 1/17 Poster of figures will be included! 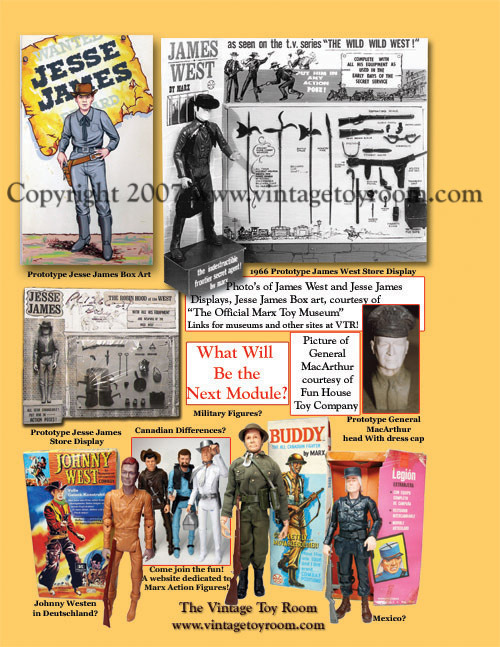 >> Click here to see a sample page The Johnny West Secttion! 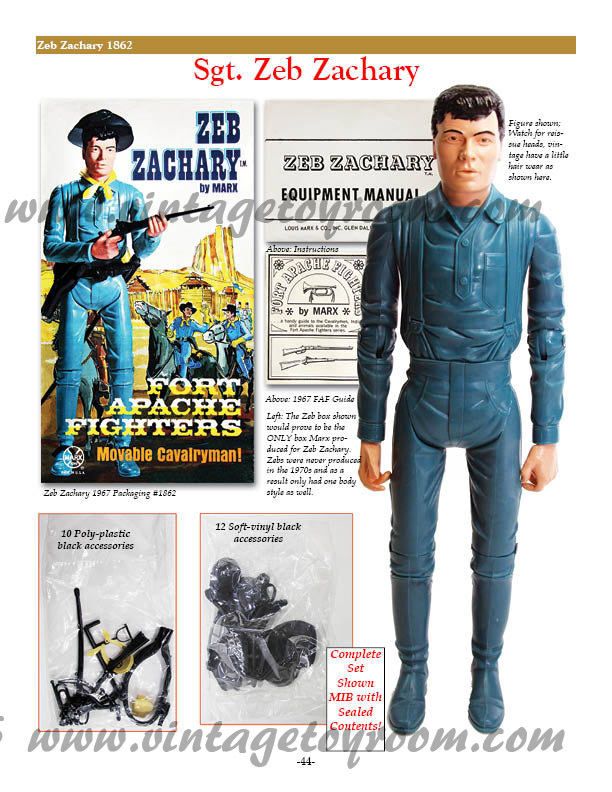 >> Click here to see a sample page The Zeb Zachary! 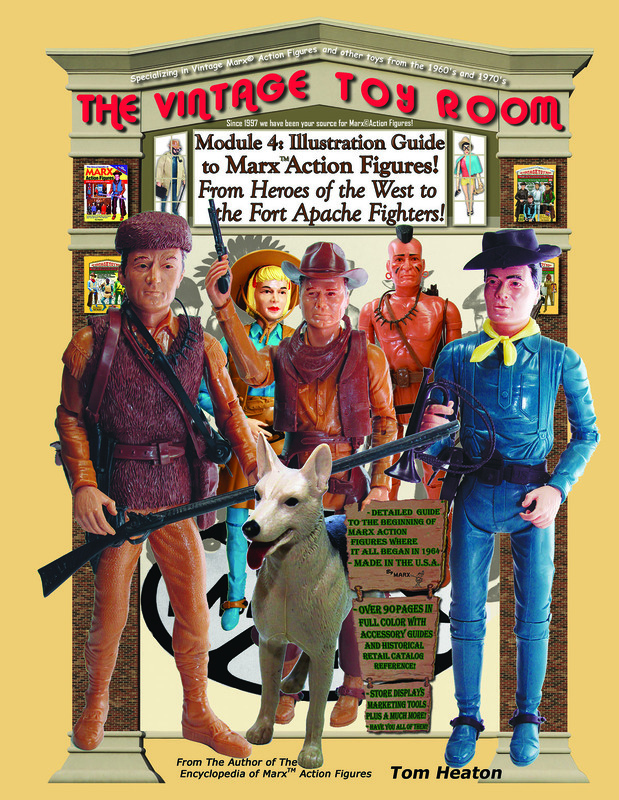 Now in stock with laminated cover and free Heroes of the West and Fort Apache series deluxe 11x17 poster! For any new orders Please Paypal your option to guarantee you get a copy! You will not want to miss out! The Purpose of these new Modules is to provide More Pictures and information in 96 pages of full Color! 98 pages in all counting the cover! We strive to have the Best photo reference for Johnny West in ink! Box art, accessories, and historical information on Marx figures! Please email or call for any International orders, shipping fees and options vary!!!. 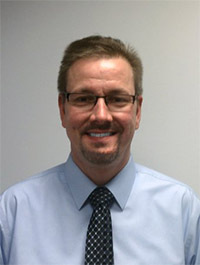 Call 585-227-9533 with any questions. 2010 delivered the THIRD of a series of ALL NEW Marx Illustration guides! 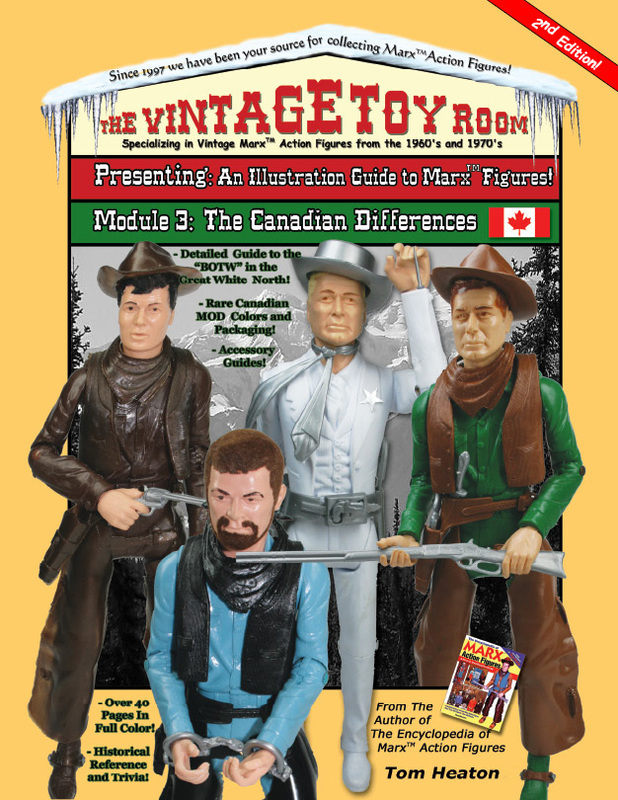 MODULE #3 The Marx Figures Canadian Differences! Includes a free Canadian Marx Figures Exclusive Figure Poster! Currently running low on supply! Now in stock with laminated cover and free MOD Canadian figure poster!! The Purpose of these new Modules is to provide More Pictures and information in 40 plus pages of full Color! 44 pages in all counting the cover! We strive to have the Best photo reference for Johnny West in ink! 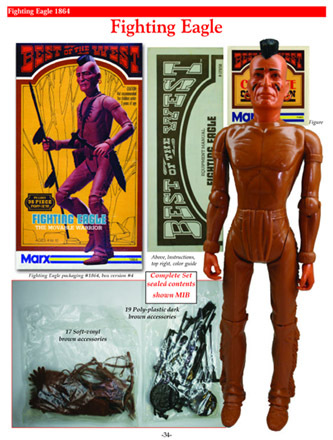 Rare Canadian Colors, Box art, accessories, north of the border information on Marx figures! Feb 2007 delivered the SECOND of a series of our new Marx Illustration guides! 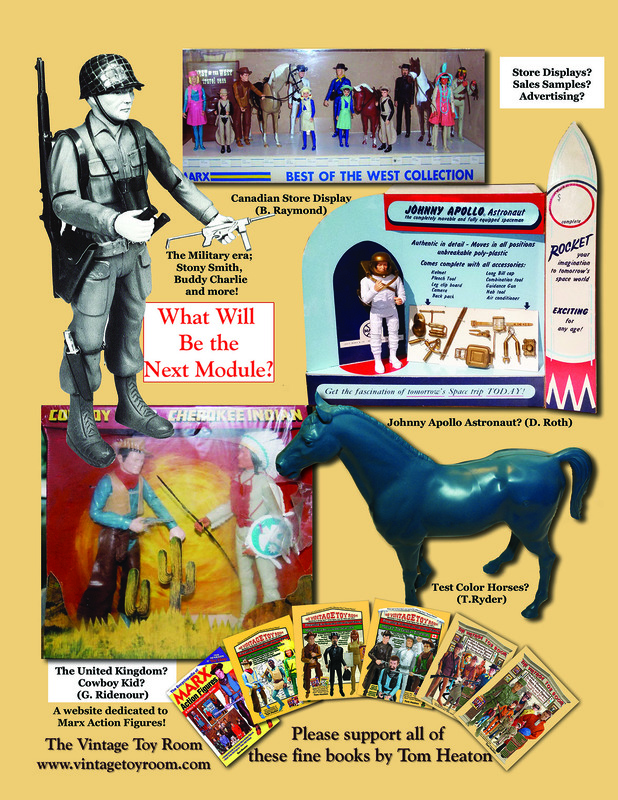 MODULE #2 The Best of The West Series!Includes a free 3D Best of the West Poster with 3D glasses for a limited time!! Now in stock with laminated cover!! Test product imagery, rare variations, and plenty of great imagery! We strive to have the Best photo reference for Johnny West in ink! Examples of Prototypes, Store Displays, Box Art are here! Feb 2005 brought you the FIRST of a series of ALL NEW Marx Illustration guides! This is an updated pressing with upgraded glossy cover a a few color adjustments made. The Purpose of these new Modules as any, is to provide More Pictures and information in 40 plus pages of full Color! 44 pages in all counting the cover! 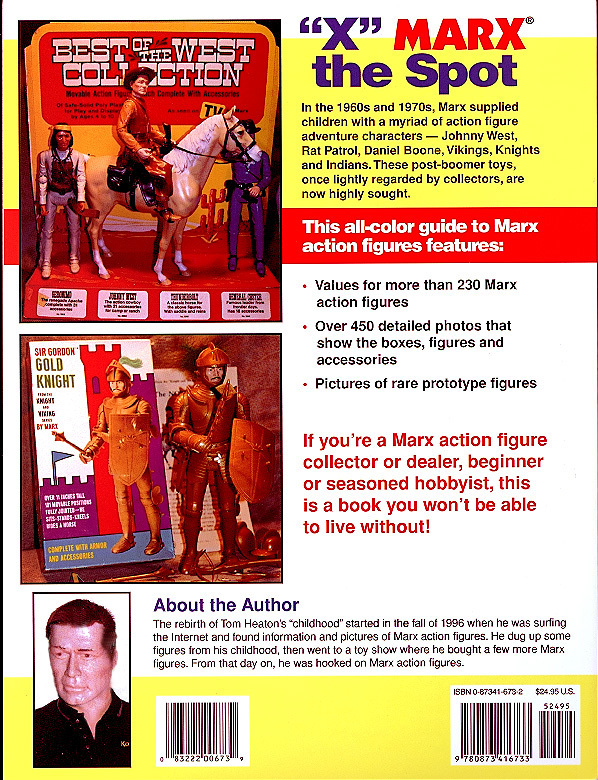 Here is the COMPLETE (All pages included..)Marx action figure book you all have known and love since 1999! You are buying from the real author! Thanks to collectors and fans out there that have supported my efforts! This was my first book, over 7000 were originally sold worldwide. We are getting low on stock. 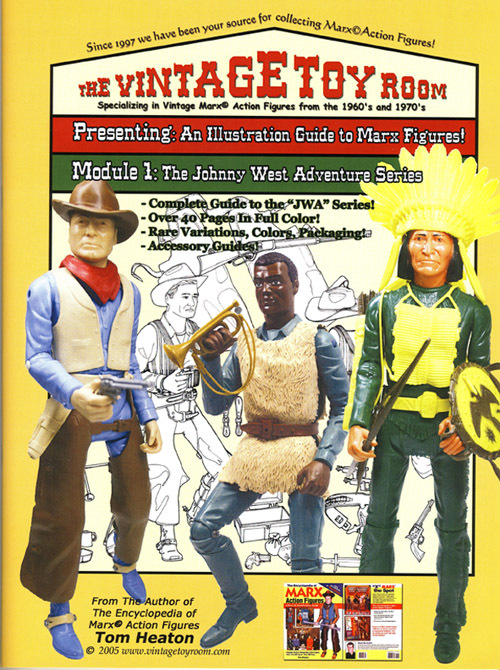 If you buy one book, this is the book you should start with for marx Action Figures and accessories. 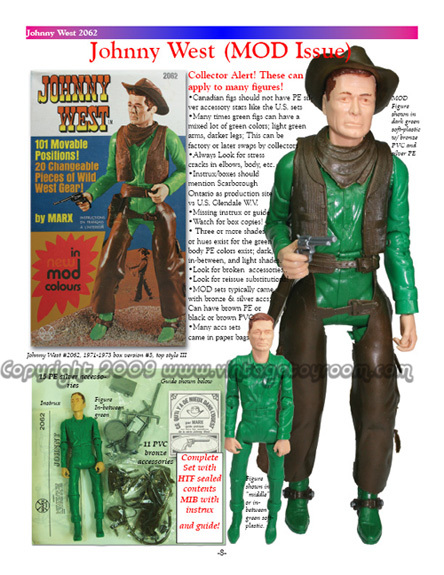 It is the baseline to any Johnny West Collecting. Many ask if I have these in stock. Yes I do, I keep them in inventory. 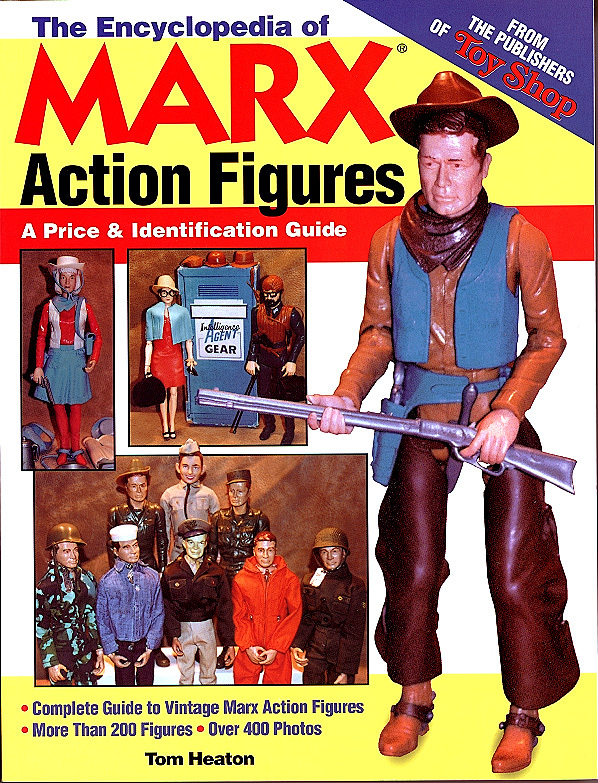 There are currently no other Marx Action figure books on the market like it with such detail! 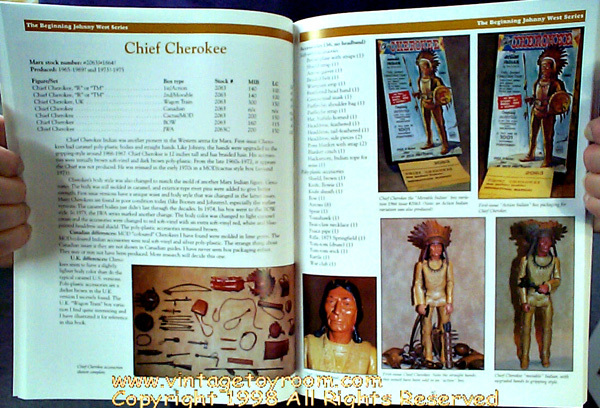 If you like Johnny West, Knights, Stony, etc for collecting, selling etc, you will want this Information packed guide! Pg. 41, Top right photo, should be NON-quick draw version of Johnny West, QD Johnny's are light blue, can be seen on page 42.
publisher did this a few times, must be high tech editor spell checkers. Pg. 90 has the same error; last sentence should read "The blue box seems to be more desired vs. (not U.S.) BOW packaging.."
Pg. 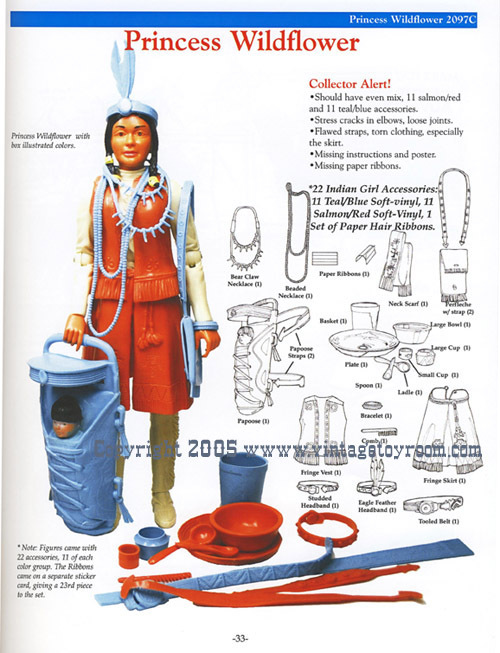 47, 70, 72, The Indian accessory lists show Blanket with strap (2), and Cinch (1), it's the same accessory. The Cinch and the Pony blanket strap are the same piece. I listed it twice, disregard one of them. How I missed this one I can't explain. My web page is correct and was done 3 years ago! Pg. 106, the Horse should be omitted as an accessory, 19 accessories is the total on the Buckboards. I never count the figures or paperwork as accessories. Pg. 147, Fatigue hats for Sgt. Starr or Baker should be 1 not 2. Mike Hazard accessory listings on page 117-118 do not list the flashlight. Instead I have the Lugar listed 2x. The accessory picture is correct, its the text list only in error. Horse Stock Numbers!! For TB's, Buckskins and Comanches, The designations after the Stock Number are as follows: Thunderbolts(A Palomino, B Black, C Brown), Buckskins(A Palomino, B Brown) Comanche (A brown, B Cream), If JWA, an Extra C is added as well. 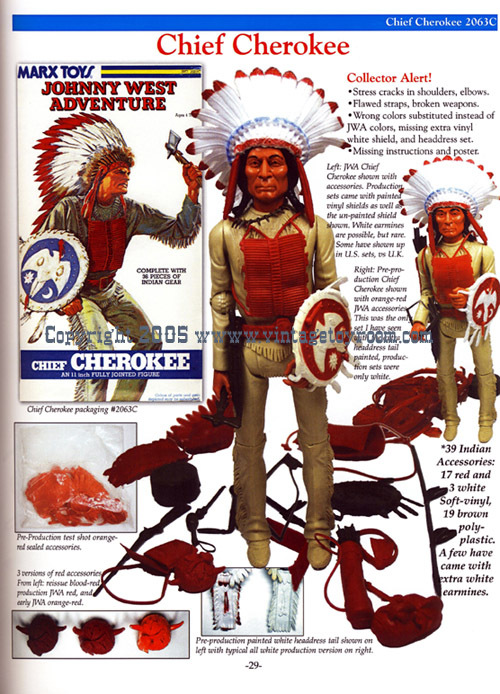 The White Sheriff Figure is Bobby Bueno, from Mexico! Not a US prototype. Since being a child, I have been obsessed with the old days. Old days to me by the way is the 1970s back to the pre world war II era. I enjoy nostalgia, looking back at photo's of my family, researching my father WWII days, up thru my childhood. In 1996, I was hit with the hunt for toys. Not just any toys, but more specifically Marx Action Figures. The problem I quickly found was there was little information on the toys. Most toy dealers would say Johnny who? Johnny West, I would reply. 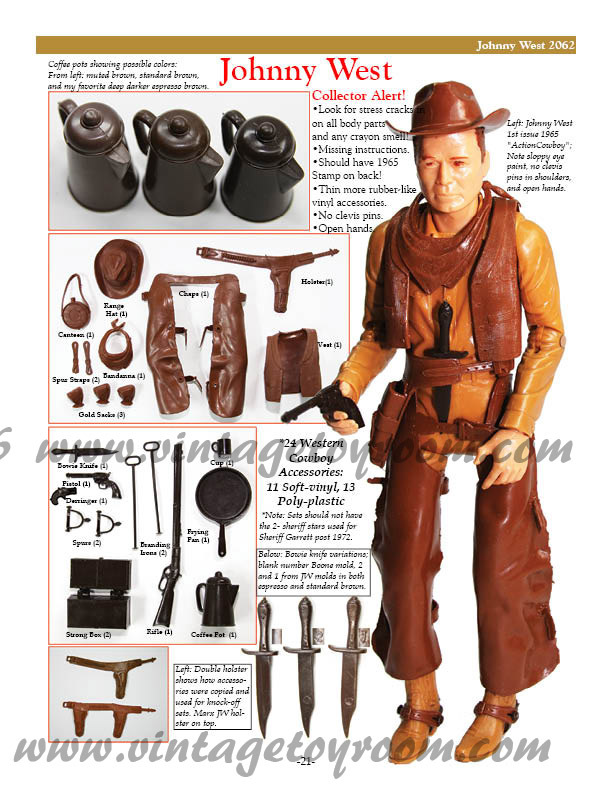 Incidently, some say my image on the left shows I have become to resemble the likeness of none other than the Johnny West action figure himself...I guess we become our surroundings. 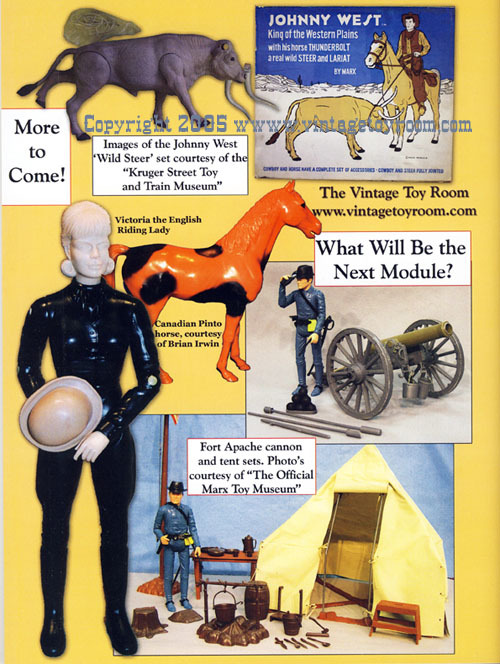 In 1999 The Encyclopedia of Marx Figures was released. this was my first book published with Krause. 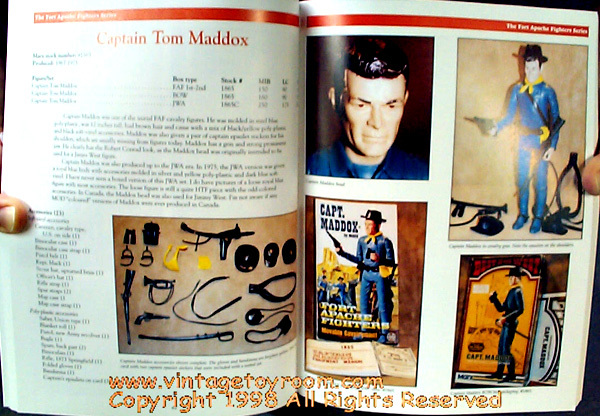 About 7-8000 copies were made and distributed worldwide through book stores, Amazon, Barns And Noble, and of course The Vintage Toy Room. The book was all shot on film. Thats right, film, not much digital help back then. I shot a few thousand pictures and had them all developed. These were then scanned, and unedited for the most part, picked over and added to the book.